NEW YORK, May 26, 2015 -- This historic Marsalis Music CD/DVD, including a full performance by the Branford Marsalis Quartet at Amsterdam's esteemed Bimhuis plus bonus interviews and audio-only disc, will be re-released on May 26 to celebrate the 50th anniversary of the original John Coltrane A Love Supreme album, released in February 1965. For Coltrane's A Love Supreme: Live In Amsterdam, label founder Branford Marsalis and his quartet have been captured in a complete performance of John Coltrane's 1964 recorded masterpiece. This legendary suite, which tenor saxophonist Marsalis included on his label's premier release, Footsteps of Our Fathers, was performed at Amsterdam's Bimhuis during a European tour in March 2003. "We felt that we were pretty much done with A Love Supreme when we went to Europe, but my manager wasn't done with it," Marsalis recalls wryly. "After hearing us perform the suite at the Bottom Line, she insisted that we had to film it so she approached Pierre about the project and he agreed." Pierre Lamoureux, a filmmaker known for his expertise in musical subjects, has co-directed with his brother many award-winning live musical films for artists including Harry Connick, Jr., Pat Metheny, Rush, and Judy Collins. "Pierre cares about how his films sound as well as how they look," Branford emphasizes, "and the combination of Pierre and the Bimhuis was too good to pass up." When Marsalis's A Love Supreme package was originally released, Branford was unsparing in his enthusiasm for the Amsterdam club, which has been a center for jazz in Europe since it opened in 1973. "I only played there once before, with Art Blakey in 1981, and I'd wanted to bring my own band into the Bimhuis ever since," he admits. "It's simply one of the two or three best jazz clubs in the world, because the room is intimate and the focus is on presenting the music instead of selling food and drinks. There is a bar outside of the performance space, and people do go there to hang, but once they walk into the club itself, it's all about the music." 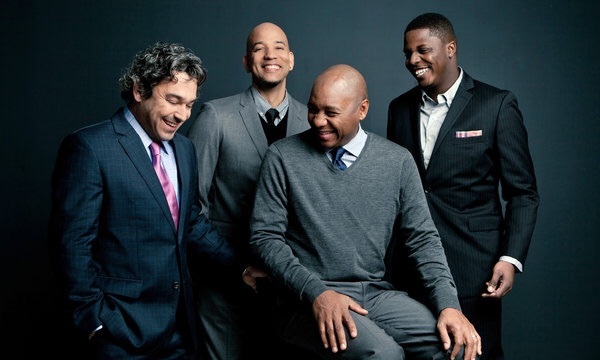 Marsalis' acclaimed quartet of that time - with pianist Joey Calderazzo, bassist Eric Revis and drummer Jeff "Tain" Watts - was all about the music as well, as they delivered a performance both musically and visually riveting. As a bonus to the live performance, all four members of the quartet, together with Marsalis' fellow saxophonists the now late Michael Brecker,Miguel Zenon, Ned Goold and David Sanchez, discuss the inspiration and the challenges presented by Coltrane's composition. In addition, Alice Coltrane, John Coltrane's late widow and the pianist in his last band, is seen in a historical 30-minute conversation with Marsalis. An audio-only disc of the Bimhuis performance is also included in the package. A Love Supreme is considered by many to be the ultimate expression of the classic John Coltrane Quartet, and remains Coltrane's most popular album. Where Coltrane only performed the suite live on one occasion, Marsalis and his band had several opportunities to play individual sections of the piece as well as A Love Supreme in its entirety before hooking up with Lamoureux for video documentation. "We definitely grew into the piece as we played it, which is why I'm so pleased that Pierre caught us when we really understood it," Marsalis reports. "One thing about A Love Supreme, it takes tremendous concentration and focus from every member of the band. The first time we played the whole thing live, all we could do afterward was sit in the dressing room for 20 minutes, totally exhausted. You don't see this band in that shape too often. By the time we got to the Bimhuis, though, we were up to the challenge." What has resulted – a scintillating live performance, plus informed musical commentary and a rare visit with Alice Coltrane – makes Coltrane's A Love Supreme: Live in Amsterdam a must for all fans of Coltrane's and Marsalis' music.